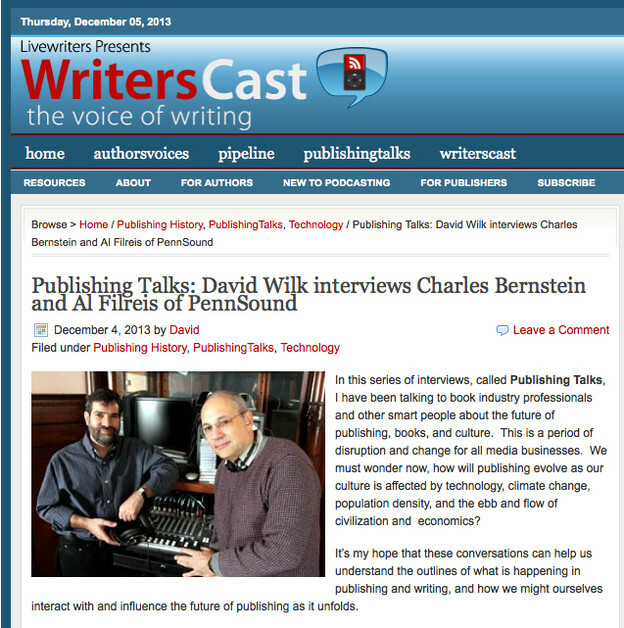 In this series of interviews, called Publishing Talks, I have been talking to book industry professionals and other smart people about the future of publishing, books, and culture. This is a period of disruption and change for all media businesses. We must wonder now, how will publishing evolve as our culture is affected by technology, climate change, population density, and the ebb and flow of civilization and economics? It’s my hope that these conversations can help us understand the outlines of what is happening in publishing and writing, and how we might ourselves interact with and influence the future of publishing as it unfolds. PennSound is a very special online resource that was instigated by founders Al Filreis and Charles Bernstein with the incredible support of the University of Pennsylvania in Philadelphia. There is really nothing like it in the world, and for anyone interested in poetry, poetics, or the literary world of the past 100 years, it is an incredibly important resource. The energy and dedication that has gone into this unmatched collection of recordings of poets reading, lecturing and talking about poetry is a gift whose impact will be felt for many years to come.